Come along with author Bree Record as she takes you on an eye-opening journey of her tumultuous life as a transgender person in the book The Road to Transition. While a critical aspect of this story may have taken forty days to create, it is the fifty-five years of this author’s life, (a life that was often felt as mere existence, rather than truly being alive) that this book also focuses upon. These years were repeatedly filled with unbearable emotional torment that is descriptively written in such extreme detail that the reader can feel and understand what it is to be living in a body that was assigned one gender at birth, but which your mind thoroughly believes is inaccurate, and should be the opposite gender. It is strongly advised to carefully read the author's prologue, and her first diary entry where she explains that this book is not just a memoir about a past life that was filled with crippling gender dysphoria. More importantly, the other part of her narrative is taken directly, and unedited, from journal entries that were created in the forty days prior to her gender reassignment surgery. The author openly admits that the wording of these journal entries are a bit awkward at times, and while it is true that mining passages directly from the source can indeed yield a plethora of raw emotion that may otherwise be missed if it were to be overly edited, this book could use a bit of fine tuning - particularly because The Road to Transition has such vividly descriptive details and moves from chapters discussing the author’s past starting from childhood all the way to the present day some five decades later interspersed with equally raw present day diary entries. Perhaps splitting this book into two separate sections starting with the author’s past living as a transgender person, and then moving onto the second part where the author embarks on her road to transition surgery by including her forty days of journal entries would make this good memoir clearer and even more impactful. Readers may also become a little bit confused at times when the author refers to her past selves as two different names, one being born as Sarah and the other being Steven. To clarify this, (and ultimately prove how disjointed the author’s life truly was most of her life) the author truly felt that she was born a female and named herself Sarah for the first twelve years of her life despite the fact that her parents named her Steven. After reading The Road to Transition and looking back and ruminating upon the book’s cover one can truly empathize with the author embarking on a journey that will ultimately lead to transition. 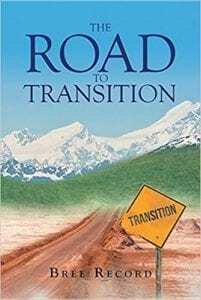 Readers will notice that the bottom of the picture depicts a desert road that is rocky and contains a broken road sign with the word “Transition” written on it. This is much like the broken and rocky life that the author led for most of her life. Proceeding up the road is a hazy greenish area in which the transition road leads directly into tall snow-capped mountains - perhaps this could be viewed as the unknown oasis in the future leading up to the better, more beautiful world that the author will be able to live in once the transition is complete. Quill says: While The Road to Transition is a winding course filled with many bumps for both the author and the reader, it is filled with emotionally charged passages that makes it a good read for not only the LGBTQ community, but for anyone who wants to truly understand what it is like to be transgender.